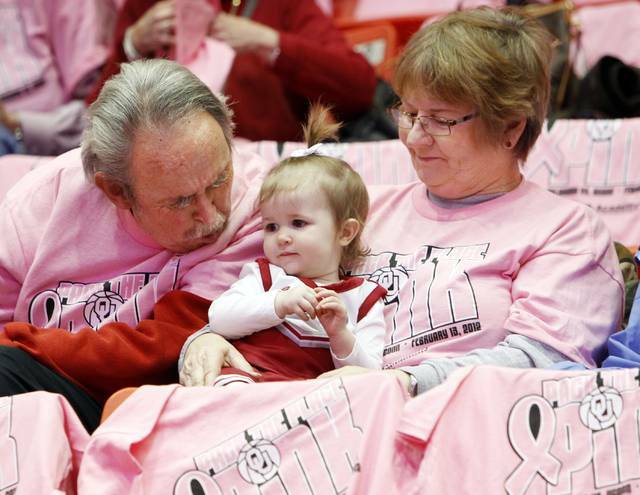 Tim Kesinger, left, talks to his 15-month old granddaughter Kate Kesinger as his wife, Charlotte Kesinger, holds her before a women’s college basketball game between the University of Oklahoma Sooners and the University of Connecticut Huskies at the Lloyd Noble Center in Norman, Okla., Monday, Feb. 13, 2012. The Kesingers are wearing pink shirts provided by OU as part of the Pack the Place Pink night to raise awareness for breast cancer and the Kay Yow Cancer Fund. This was Kate Kesinger’s first OU basketball game. Photo by Nate Billings, The Oklahoman.